Justin Gatlin lost the 100m challenge against Usain Bolt, in the year which saw him as undisputed ruler, though failing the crucial event, judged by many almost as a sort of battle between good and evil due to the USA sprinter’s not limpid past. At the end of the race TVs from all over the world tried to stop the two sprinters to get their first impressions. Gatlin, in particular, did not appreciate the media activity after the final, especially British BBC, which Gatlin swore never to talk again with. Why? Bolt and Gatlin are on the starting blocks of the 100m final, the scepter and the supremacy which has covered Jamaica with gold for seven year, is now on the line. As soon as Bolt passed the arrival line, putting between the USA rival and himself one hundrenth of second, the BBC reporters have openly and profusely cheered for the Caribbean victory; such cheerings were recorded and posted on Twitter. “He saved his title, he saved his reputation and he might have even saved his sport”, the BBC reporter Steve Cram enthusiastically stated as soon as the Jamaican had crossed the arrival in 9”79. This clearly upset Gatlin, who felt once more defamed, especially by being considered the evil Bolt saved athletics from. “Justin, just like me, thinks that British media and journalists were extremely unpolite with him. Nothing positive has been said about him for a long while. 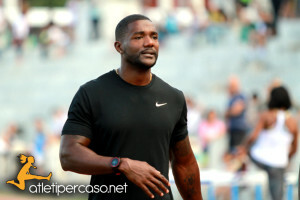 Every characterization is exclusively about doping, which defames him”, Gatlin’s agent, Renaldo Nehemiah said.